VPGenius.com is an all inclusive video poker website, and plays host to several excellent video poker articles, half a dozen calculators and tools, and descriptions of hundreds of video poker games and variations. The site is free for its users, and also has info on online video poker games and software providers. The binomial distribution calculator lets you determine the probability of having an exact number of successes out of an exact number of trials with a predetermined probability of success. I'll explain how this is relevant. As you can see, the probability of hitting zero royal flushes over 40,000 hands of Jacks or Better is roughly 37.1%. This tool can be used for tons of video poker calculations including figuring out the likelihood of hitting a four of a kind in 100 hands, and other similar calculations. The Bonus EV calculator is used to calculate the expected value of an online casino bonus. You enter in your deposit amount, the bonus amount, whether the bonus is given before or after wagering, the wagering requirements, the expected value of the game you're playing, and the % that the game you're playing contributes towards the bonus. Although the bonus you're getting is $100 (a 10% match), the actual expected profit is only $24.74 because of the requirements. I used full pay Double Bonus for the example, and assumed that every $100 earned you 1 point, and every 10 points earned you $1. 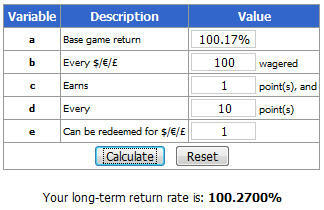 In this case, the long term expected return is increased from 100.17% to 100.27%. VPGenius.com is an outstanding website that offers top notch content as well as extremely useful tools. They get an A+ in my book, especially because everything is offered at no charge. Head over to VPGenius.com to learn more.